In early January 2011 Eizo had a press release for the FlexScan SX2762W that seemed to be too good to be true – a IPS LCD panel with a native resolution of 2560 x 1440, a maximum brightness of 270 cd/m2, contrast ratio of 850:1, 6 ms gray-to-gray response time and 178° viewing angles – without the typical several thousand dollar Eizo price tag! Wide color gamut reproduces 97% of the Adobe RGB color space. Integrated sensor counteracts the influence that changes in ambient temperature have on the display of color tones. On-screen button guide for easy adjustment in dark work environments. Simulation of two types of red-green (protanopia and deuteranopia) and one type of blue-yellow (tritanopia) color blindness.3 This allows designers to ensure their color schemes can be recognized by people with all types of color vision. All of these features add up to a nice display that seems to be more consumer focused than their other offerings. One such feature is its EcoView sensor. This feature puts the display in sleep mode when you aren’t actively moving in front of the display. I had to disable this feature as apparently I don’t move much when I’m working and for photography you want the display running at full operating temperature when you are working, so this feature really isn’t for Photographers. How does it compare to the CG243W? The Eizo CG243W (replaced by the CG246-BK) is the best monitor I’ve ever used – period. While the SX2762W is nice because it offers a big honking amount of screen real estate and lots of cool new eco friendly features that make it cheaper to operate, I just never liked it as much as the CG243W. I’m probably biased as the CG243W was my first long-term personal experience with Eizo displays, but this display didn’t have that super high-end feel of the CG243W. From what I can tell, this is not a hand inspected display like the CG series so it doesn’t come with an inspection report. The out of box quality of my test unit was outstanding (no dead pixels, calibrated very well out of the box, and fantastic edge to edge performance). How does it compare to the NEC PA Series? See my NEC PA Series article for comparison details. Let me state up front that this display supports the superior hardware calibration design and can be calibrated accurately. I just hate how that process works with this display. Eizo tried to make this display easier to calibrate with its own Eizo branded EX1 Color Sensor, but honestly I hated the EasyPix calibration software. It also really annoyed me that it kept a window open all of the time so my task bar (instead of the system tray) was always occupied with a running app that I couldn’t close. I already own 4 other sensors, yet this display requires you to use their sensor to calibrate which is honestly just lame. WARNING: This display (like all good high-end displays) requires hardware calibration, so you may NOT use a third party calibration solution or software to calibrate it. Doing so is virtually useless. I recommend that you order the FlexScan SX2762W from B&H, Adorama or Amazon. At only $1469 (as of the time of this writing) it’s a screaming deal for an Eizo! A hood is also available. If you are used to an Infiniti or Lexus car and you end up in a Nissan or Toyota that is functionally equivalent to the luxury brand, you can’t help but still think that the product you are in is inferior. Now a data analysis might suggest they are identical, but there’s that subjective thing that keeps getting in the way. This is basically how I feel about this display. It’s a good product that performs well and is a true Eizo display, but it feels a bit like some magic is missing. I’m sure if I looked at it objectively I’d have to pinpoint my feelings on my desire to have more control over the calibration process using my preferred calibration hardware, so it really isn’t anything to do with the monitor itself. As a result, I think I can honestly give this display a solid recommendation as I can’t imagine anyone not loving the great picture it offers (especially when calibrated) as well as its great size and feature set. I’d say that Eizo faithful are still probably going to be happier spending the extra money on something like a CG275W, but this display is half the cost of that so it’s hard not to choose this model instead. That’s the magic that NEC has enjoyed with its PA Series, and after having this display side by side to an NEC PA Series for a couple months, I’d say that the picture quality is probably better on this display. 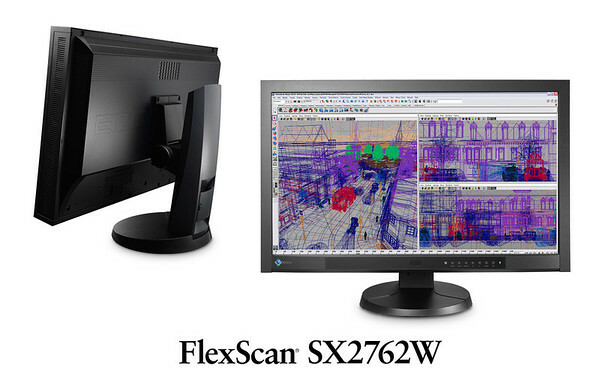 Given the superior warranty and Eizo’s good name, it’s tough not to spend the extra bucks and go for the SX2762W. I was provided with a loaner display for review. I may also get a commission if you make a purchase using the links in this article. Thanks for supporting the blog by using my links!